I thought Gaussian quadrature requires that the integral must be transformed to the integral limit of [-1,1]? Question asked on YouTube: I thought Gaussian quadrature requires that the integral must be transformed to the integral limit of [-1,1]? The answer is given below. 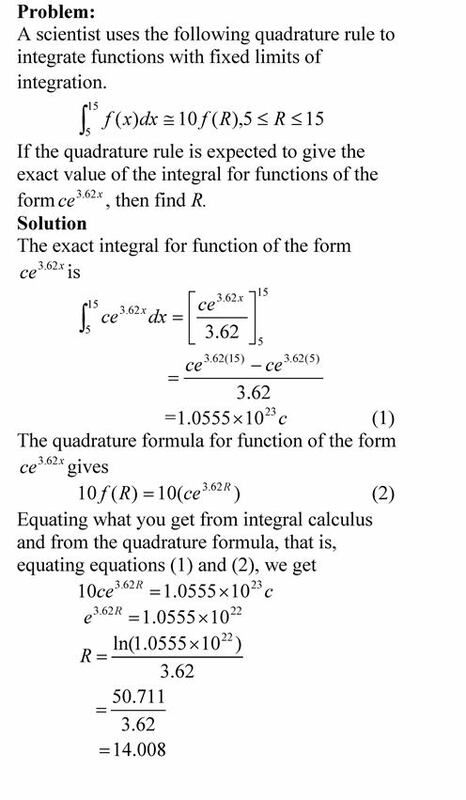 Author Autar KawPosted on 25 Nov 2017 25 Nov 2017 Categories Integration, Numerical MethodsTags Gauss quadrature rule, Integration, Numerical MethodsLeave a comment on I thought Gaussian quadrature requires that the integral must be transformed to the integral limit of [-1,1]? To relate how quadrature formulas are derived, see a simple example of how to do so. See the pdf file for solution. This is a solution to the problem I gave to the class in a recent test. A robot follows a path generated by a quadratic interpolant from x=2 to x=4. The interpolant passes through three consecutive data points (2,4), (3,9) and (4,16) and is given by y=x2. Find the best estimate of the length of the interpolant path from x=2 to x=4. The solution is given as an audio pdf (also called pencast – need Adobe X reader or higher). Three methods are shown. I expected one to use Method 2 or Method 3. Recently, I got a request how one can find the quadrature and weights of a Gauss-Legendre quadrature rule for large n. It seems that the internet has these points available free of charge only up to n=12. Below is the MATLAB program that finds these values for any n. I tried the program for n=25 and it gave results in a minute or so. The results output up to 32 significant digits. Author Autar KawPosted on 3 Apr 2009 3 Apr 2009 Categories Integration, MATLAB programmingTags Integration, matlab2 Comments on How do I integrate a discrete function in MATLAB? Many students ask me how do I do this or that in MATLAB. So I thought why not have a small series of my next few blogs do that. In this blog I show you how to integrate a continuous function. % How do I integrate a continuous function? Why keep doubling the segments for an automatic integrator based on Trapezoidal rule? This post is brought to you by Holistic Numerical Methods: Numerical Methods for the STEM undergraduate at http://numericalmethods.eng.usf.edu, the textbook on Numerical Methods with Applications available from the lulu storefront, and the YouTube video lectures available at http://www.youtube.com/numericalmethodsguy. Author Autar KawPosted on 23 Feb 2009 24 Feb 2009 Categories Integration, Numerical MethodsTags automatic integrator, Integration, Trapezoidal rule1 Comment on Why keep doubling the segments for an automatic integrator based on Trapezoidal rule?